Contact Little Legs Dog & Cat Rescue at Little Legs Dog & Cat Rescue Qld Inc to express your interest. 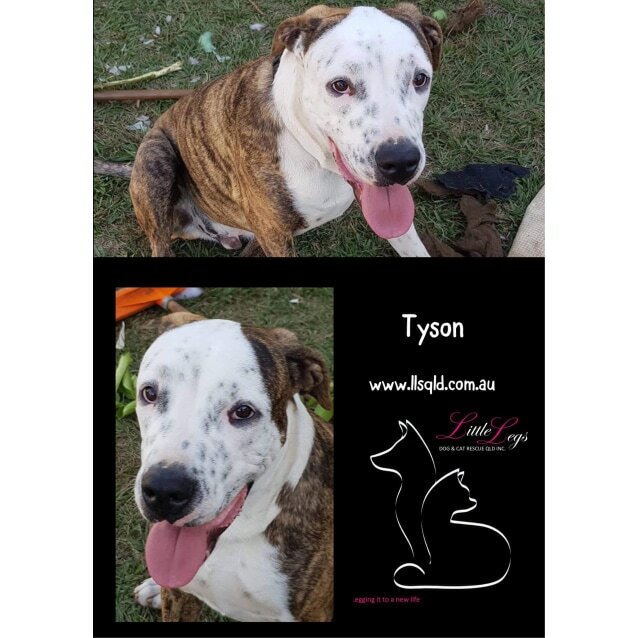 With a strong guiding hand and constant training, Tyson will be a wonderful dog. When he's sitting he loves cuddles. He is very strong and pulls on the lead. Unfortunately since his time in our care as a little puppy his previous owner has put very little time into obedience or training. Tyson is a very big boy who is totally unaware of his own size. A strong and active owner who will exercise and train him is the perfect person for him, a big yard with room hi stretch his lovely long legs and release his energy. Tyson is very friendly with other dogs but can be very over the top in his excitement, another big dog able to show him the way would be his ideal playmate. 💫To be considered for a meeting please fill out our obligation-free application form below. Applications will be forwarded to the carers. *Please Note- Some animals are extremely popular and generate a lot of interest, carers will call only suitable applicants to arrange meetings and not every applicant will receive a call back. All dogs are to have a meet and greet (where possible) and be approved by the foster carers and the adoption application. All dogs will be desexed, vaccinated, microchipped and heartworm treated before being rehomed. All cats are to have a meet and greet (where possible) and be approved by the foster carers and the adoption application. All cats will be desexed, vaccinated and microchipped before being rehomed.